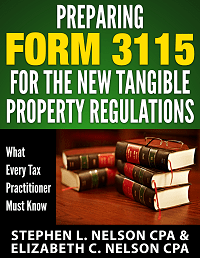 We provide quite a bit of coverage of the new-for-2014-tax-year tangible property regulations and also coverage of the steps required when preparing Form 3115 for the new tangible property regulations. We’ve got an introduction to the subject in a blog post here and then talk in more detail about how these new regulations affect real estate investors and small businesses here. We also provide some detailed instructions for preparing the Form 3115 one needs in order to effect the new regulations here and here and include some sample 3115 forms in these posts. This short (70pp) downloadable e-book explains in detail how the new regulations change the way small taxpayers need to do their accounting for tangible property deductions, outlines an approach to complying with new regulations with a minimum amount of fuss and handwringing, and supplies a sample accounting policy which should help a small taxpayer stay in compliance in the future. And an important note: We’re providing a money-back guarantee… if you’re an attorney, CPA or enrolled agent and you don’t find our e-book saves you several hours of time, just email us and ask for a refund.